Air Canada marked International Women’s Day 2018 yesterday (March 8) by operating two intercontinental flights from its global Toronto hub across both the Atlantic and Pacific with all female pilots and flight attendants. The flights were additionally supported by female ground crews providing aircraft servicing, loading, dispatch, pushback functions, customer boarding and more. “Today we proudly salute and acknowledge the achievements and contributions of the more than 13,300 women working at Air Canada worldwide. 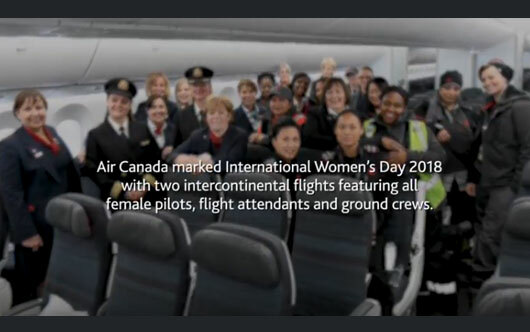 This year marks the third consecutive year and the fifth and sixth all-female flights we have featured on International Women’s Day, highlighting the range of professional roles that skilled women in aviation work in every day,” said Arielle Meloul-Wechsler, senior vice-president, People, Culture and Communications at Air Canada.